Install up to four SSDs in the dedicated 2.5-inch drive bays to enable SSD caching and Qtier for optimal system performance. The built-in 10GBASE-T port empowers mission-critical applications such as databases and virtualization. The TS-963X can directly host virtual machines and containers, and act as storage for hypervisors such as VMware®, Citrix® and Microsoft® Hyper-V®. The Hybrid Backup Sync app completes your backup strategies, allowing you to back up, restore and sync files locally and remotely. Snapshots add an extra layer of protection to your disaster recovery plans, giving you the flexibility to create and revert snapshots locally and/or remotely. 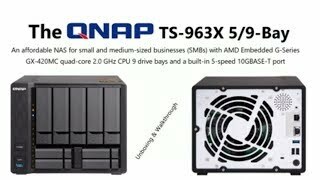 Besides conventional expansion enclosures, the TS-963X can utilize QNAP's Virtual JBOD technology to use the unused storage capacity of other QNAP NAS. As your business grows, so does your storage requirements. The storage capacity of the TS-963X can be expanded by using QNAP VJBOD technology that allows the TS-963X to be expanded using the unused storage capacity from another QNAP NAS, or by using up to 1 UX-800P and/or UX-500Pexpansion enclosures. Read more about Qnap TS-963X-8G auto tiering. If you buy this Qnap Desktop NAS and hard drives we do free build and test for the unit and hard drives. So you can use this device straight out of the box. All free of charge in TS-963X-8G price. This is great video editing solution with its 10gbe network port. Faster transfer and sharing.